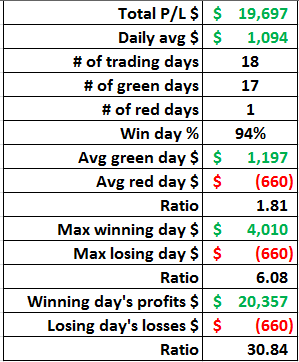 I am closing March with +$19,697 in gains and 9 straight green weeks for +$30,072. This is my biggest month since I started and longest winning streak ever. However, not only is this the most monthly gains and longest winning streak I have ever achieved, it is my best performing month ever when you look at the data. That is more exciting to me then the gains! Why is the improvement in my trading data more exciting to me then the gains? The reason is because it means my trading is fundamentally improving. This month I stayed disciplined and stuck to my rules. I worked fiercely on my two weak links: stubbornness on taking losses and forcing profits. I stayed happy with base hits and cut my losses. I stayed patient on entries and can honestly say I did not let FOMO get me into any trades this month. I was picky on what trades to take and I actually traded less than in past months. All of this work added up to consistency in my trading. It showed me what is possible when you stay disciplined. It is the improvement in my trading performance that will yield long-term results similar to this month’s gains. That is why I am more excited about the data then the gains. My biggest month up until this point was last November during the shippers craze. I closed the month +$16,076–$12.6K of which was from the shippers I shorted. However, to get those gains I broke all of my rules. I risked blowing up my account in all honesty. All last year my trading was like a roller coaster. I would have big wins then huge losses. I was undisciplined and stubborn. One thing that really stuck out to me about this month and past 9 weeks is how stress-free it has been. I started to trust myself in my trading because I knew I would actually stop out when I should instead of getting stubborn. I never risked having a huge loss or blowing up my account. Moving forward from this month I would like to work on trading around a core and adding to my winners. Right now I usually just scale into the trade at the start and scale out at the end. Once a trade has been confirmed I would like to see myself adding on bounces and covering those adds on the pulls, keeping a small core to trade around. I could significantly improve my profits if I get better in this area. 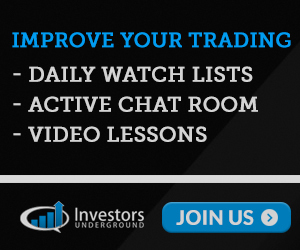 How many trades do you make a day in average? And what did you do about the PDT rule? I scale in and out of trades so there can be a decent number of trades each day. However, I only usually trade 1-4 tickers a day. I started with more than 25K so I did not have to worry about the PDT rule. I found you on twitter and I’m inspired by your turn around. My profit curve looks the same with the exception of still negative -$20k so not turning a profit just yet. I started in May 2016 but I feel I still have a lot more to learn. I would love to pick your brain on what were some things you did to break the negative streaks. Thanks for the kind words. I am glad you find inspiration from my story. Honestly, an incessant focus on my weaknesses was what really helped me. I used my family, twitter and this blog to help hold me accountable to my rules. I still mess up though at times and that can be frustrating. It takes constant effort.